As Chrissy’s story continues, she’s a new bride in a new town, ready to work for the Lord. But her efforts are thwarted at every turn. The town refuses to organize a Christian Endeavor Society, the church members laugh at her behind her back, and her attempt to make friends prompts a woman to order Chrissy from her home—and never come back! Humiliated, Chrissy’s first thought is to retire from the Lord’s work, but her energies and ideals won’t let her stay idle for long. With renewed conviction, she tries again—but this time, there’ll be no grand Christian Endeavor Society with committees and meeting minutes. This time, she’ll belong to an Endeavor Society of two—with Jesus Christ at the helm and Chrissy working to accomplish His good. This unabridged edition of the 1891 classic Christian novel includes a biography of the author, group discussion questions, and additional bonus content. 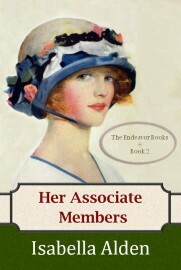 Would you like to view and print group discussion questions for Her Associate Members? Find them here.